FIELD MUSEUM—About eight hundred years ago, a ship sank in the Java Sea off the coast of the islands of Java and Sumatra in Indonesia. There are no written records saying where the ship was going or where it came from–the only clues are the mostly-disintegrated structure of the vessel and its cargo, which was discovered on the seabed in the 1980s. Since the wreck’s recovery in the 1990s, researchers have been piecing together the world that the Java Sea Shipwreck was part of. 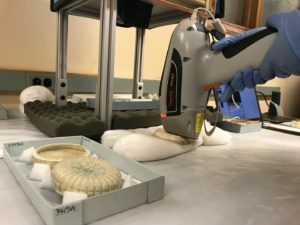 In a new study in the Journal of Archaeological Science, archaeologists have demonstrated a new way to tell where the ceramic cargo of the ship originally came from: by zapping it with an X-ray gun. Ceramic bowls in situ at the Java Sea Shipwreck site. Field Museum, Anthropology. Photographer Pacific Sea Resources. Ceramics from the Field Museum’s Java Sea Shipwreck collection being analyzed by portable X-ray fluorescence. Field Museum. Photographer Kate Golembiewski.